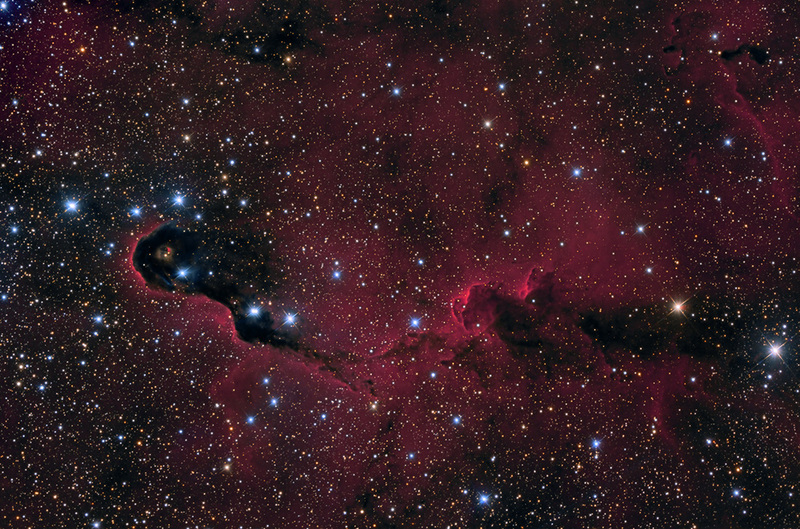 is but a tiny feature in the huge emission nebula IC 1396. The Elephant's Trunk is by far the most interesting portion of the larger dim and diffuse complex. The trunk is often incorrectly called 1396, or vdB 142, which is a small blue reflection nebula near the tip of the trunk. The nebula is thought to be the site of star formation containing several young stars (less than 100,000 years) discovered in infrared images in 2003. Two older stars are present in a small, circular cavity in the head of the globule and the stellar winds from these young stars may have emptied the area. The combined action of the light from the massive stars ionizing and compressing the rim of the cloud and the wind from the young stars shifting gas from the center outward, lead to very high compression in the nebula. This data was acquired from New Mexico Skies in 2011.